Talk about such a sweet couple. I was so blessed to meet Casey & Max when a fellow wedding professional vendor, recommended my name their way. I met Casey and fell in love with her charismatic energy and upbeat vibes. 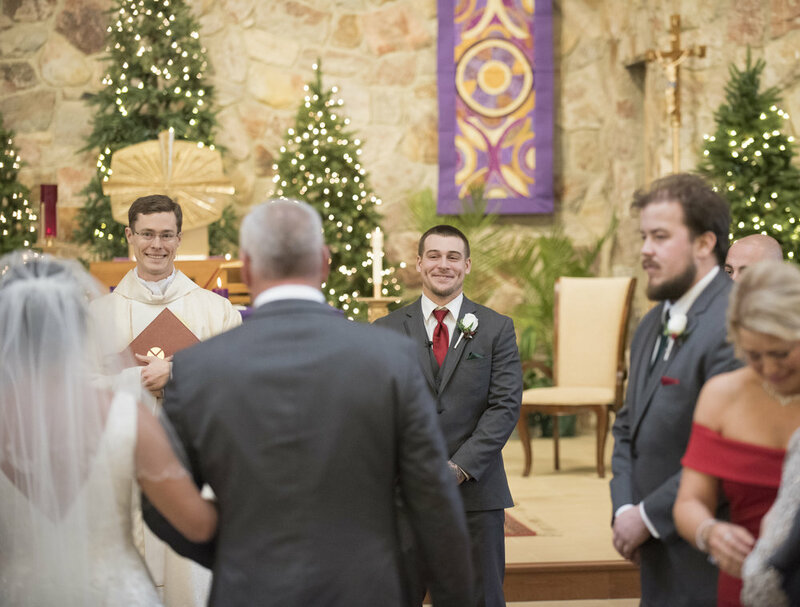 Casey & Max had a perfect winter wonderland wedding just a few days prior to Christmas day. Their decor was festive including beautiful bridal bouquets with pine and red winter berries. They spent their morning prep with their closest friends! (a HUGE bridal party of 20 friends, in fact!) Everyone in the bridal party was an absolute blast from the beginning to the very end of the day! I arrived to the ladies beautiful bridal suite at The Crowne Plaza Hotel (which had a STUNNING skyline view of Philadelphia) and there was so much excitement in the air. Casey & Max said I DO in the beautiful, St Joan of Arc Catholic Church in Marlton, New Jersey. Following the ceremony, there was a pleasant surprise- Casey managed to get Max’s historical car to the church and waiting out front with adorable JUST MARRIED signs and a Christmas wreath! He was in complete surprise with the car! We met at the local Croft Farm in Cherry Hill for portraits which made a wonderful backdrop with the bridal party with the mint green doors on the barn! They spend the remaining of their wedding day at the Crowne Plaza in Cherry Hill, where they danced the night away with family and friends. Casey & Max was such a fun and upbeat couple to get spend along their side on their wedding day. They were filled with many smiles, giggles and just fun energy! It was such a PLEASURE to capture their special day.